The New Zealand IoT Alliance have completed their research and estimate that IoT could create a staggering $2.2 billion in net economic benefit for New Zealand over the next decade! Join New Zealand IoT Alliance with the Hon Simon Bridges to celebrate the publication of The Internet of Things – Accelerating a Connected New Zealand. Get your free tickets for the IoT Alliance Research Report Launch in Wellington, June 29. The big Hamilton Fieldays is happening where you will see a lot of New Zealand and Australian customers showcasing exciting use cases for IoT. IoT Agribusiness technologies help to increase productivity, reduce cost over time and simplify management of compliance for Farmers. How many mobile applications will a Farmer need to manage their farm this year? We will be on hand if you need last minute data SIMs. The Hamilton Fieldays will also mark a special milestone with practical demonstrations of low powered wide area networking for Agribusiness solutions using Sigfox from Thinxtra and LoRaWAN from Spark. Security in IoT continues to be in the news headlines and we want to shine a spotlight on it in this newsletter. We are ready to help and work through practical solutions so keep an eye out on our social media and blog postings. If you are thinking of setting up your M2M & IoT solutions in Australia and need Data SIMs then let us introduce you to our M2M One Australian mothership and they will help supply you with Telstra M2M Data SIM cards. Just email us on info@m2mone.co.nz and we will make it happen. Thank you again for sending through your feedback to our newsletter as we start to build our local community of IoT Partners. This month we look at updating the End Customer field in the M2M Control Centre – This allows you to keep customer information that can be searched and filtered against each SIM card in your account. Manually – You can update this information individually by going into the SIM List in Control Centre and clicking on an individual ICCID number. This will bring up the Additional Information section – From here click the End Consumer subtab. Information entered and saved in the “End Customer” field will display in the SIM List page. Bulk update – Control Centre allows you to bulk update information by uploading a formatted Excel spreadsheet. To perform a bulk upload, create a spreadsheet in Excel with two columns, the first column heading should read “ICCID” (column rows should contain your SIM ICCID numbers) and the second column heading should read “End Consumer ID” (column rows should contain you customer name data). Save the file as Excel 97-2003 Workbook (.xls). Once you’ve prepared your spreadsheet navigate to the SIM List and click the Batch Update tab from there follow the prompts to upload your file. Batch updates generally take 5-10mins to complete depending on the amount of data being updated, and you will receive an email when the fields have updated successfully. Have more questions about the M2M Control Centre or want some training? Contact your M2M One account manager. 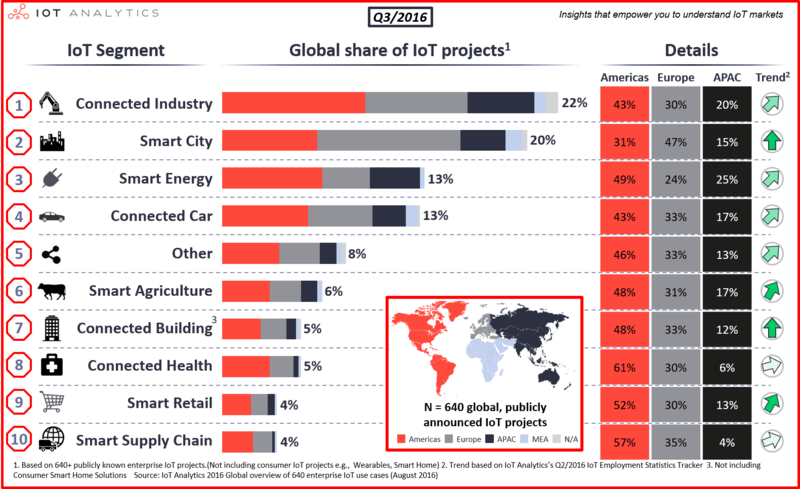 Most IoT projects have been in the Industrial area (22%), followed by Smart City initiatives (20%), which isn’t perhaps surprising because industry have strived for decades to achieve precise information about their processes. 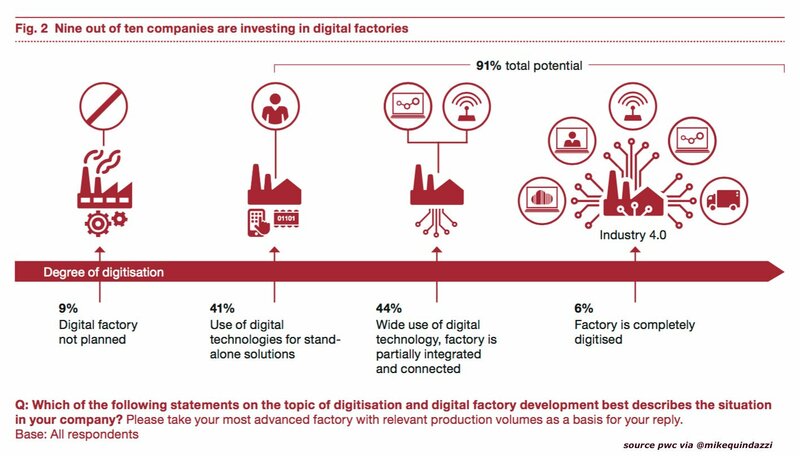 Connected processes are a relatively new development in agriculture, health, retail and supply chain management, but their share of global projects will likely increase in the next few years. The ransomware attack in the last month has renewed attention to security, and the IoT space is rife for exploitation of the unwary. Challenged designed devices often forgo encryption and other security features, and often depend on easily bypassed encoding, giving hackers easy access to a device, and potentially all other devices attached to the same network. A Techcrunch contributor recently installation of a low-priced Webcam (US$12) and observed it being compromised by Malware within 98 seconds, posing a real privacy risk to his home and family. Webcams aside, it could be said that most home IoT-based devices provide little risk other than nuisance, but in the industrial, agricultural and security sectors, interference can result in substantial losses that we need to plan defences against. It is important to know the security profiles associated with your devices and to match that with the risk to intended use. If you have concerns, call the M2M One Tech team for advice.